Everyone grows up hearing little fantasy tales that we eventually learn aren't true. Whether it's Santa Claus and the Easter Bunny or house hobs and brownies, the world gets a little bit less magical as we age. But what if these stories come back, with a vengeance, in your teens? This is Miss Peregrine's Home For Peculiar Children, and for Jacob, these stories hold more magic, and more horror, than his five-year-old self could ever have believed. Jacob was raised on his grandfather's stories of the children's home he grew up in. Abe told Jacob fantastical stories of the monsters he escaped by arriving at the home, the wonderful woman who raised them, and the amazing feats that his fellow children could perform. The ability to create fire, to levitate, to lift boulders, invisibility. He even hand black and white photos that supported his stories. But as all children do, Jacob eventually grew up. "Logic" began to displace "fantasy," and Jacob stopped believing his grandfather's stories. Abe had a hard life, he reasoned. Born in Poland, he was sent to the children's home to escape the Nazi's, and lost his entire family back in Europe. Of course the children's home would seem like a magical place to him. The monsters he told of had any number of possible real-life counterparts. Perhaps, after losing so much, it was simply easier to tell these stories instead. When Jacob finds his grandfather dying in the forest behind his house, after what seemed like an especially bad bout of dementia-induced disorientation, Jacob's world is turned upside-down. Officially the death was blamed on wild dogs, Abe's death was a violent attack. In his dying moments, Abe was able to give Jacob a few cryptic clues to his past. Paired with a glimpse of what actually attacked Abe, a series of events is set in motion that only a youngster listening to his grandfather's stories might believe. Chasing these monsters leads Jacob across the pond to Britain and the bombed-out remains of the home that Abe grew up in. And while exploring the remains of the U-Boat attack, Jacob runs into a very peculiar group of children, indeed. This book is in turns a ghost story, a time-travelling adventure and a coming-of-age story. Jacob very quickly grows from a poor-little-rich-kid working at this family's pharmacy chain to a young man fighting to defend a band of children against monsters literally straight out of his nightmares. He learns that some things are worth fighting for, and is betrayed in the most under-handed of ways. 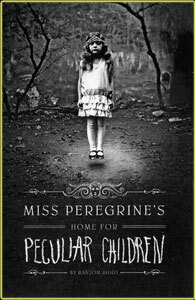 Miss Peregrine's Home For Peculiar Children is another piece of young adult fiction that is worth reading for people of all ages. The photos within are all found material from photo collectors who loving scavenge piles for the most peculiar and strange images of a bygone era. For the art alone, this would be a book to check out, but paired with a lovely story this is one that would be a shame to miss. Highs: The contrast between war-torn Europe and the idyllic country home makes for beautiful, haunting imagery. Lows: There are several side characters with talents and personalities what desperately need more exploration. Verdict: Yet another excellent addition to the young adult genre.